Great cities marked the earliest development of civilization. From the world's first true cities, in Mesopotamia, to the spectacular urban centres of the Maya in Central America, the places described here represent almost three millennia of human history, society and culture. 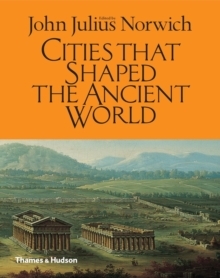 Arranged geographically into five sections, each with an introduction by John Julius Norwich, Cities That Shaped the Ancient World takes a global view, beginning in the Near East with the earliest cities such as Ur and Babylon, Troy and Jerusalem. Africa gave rise to the conurbations of ancient Egypt such as Thebes and Amarna, and also the Ethiopian capital of Aksum. Glorious European metropolises, including Athens and Rome, ringed the Mediterranean, but also stretched to Trier on the turbulent frontier of the Roman empire. Asia had bustling commercial centres such as Mohenjo-daro and Xianyang, while in the Americas the Mesoamerican and Peruvian cultures stamped their presence on the landscape, creating impressive monuments, as at Caral and Teotihuacan.